Souraya was born in Lebanon, and moved to Brazil at the age of 15. She has a business administration degree from the Pontificia Universidade Católica de São Paulo. 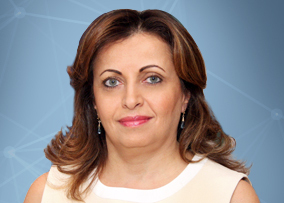 Between 1987 and 1992, Souraya worked as an independent consultant in the IT sector where she assisted with the development and supervision of IT system implementations for private and public companies. From 1993 through 1996 Souraya was employed by the city hall, after which she joined the Boston Bank as an Administrative and Project Manager for the Private Banking Area. In 1999 Amicorp opened an office in São Paulo Brazil; Souraya saw this as a new opportunity and joined Amicorp Brazil to be part of the challenge of setting up this new Amicorp office. Souraya acted as the Marketing Director and later Managing Director of this office. In 2015 Souraya became the Chief Internal Organization Officer for Amicorp Group, and is now based in Barcelona. Souraya speaks fluent Portuguese, English and Arabic and has a good knowledge of Spanish and French.